NaNoWriMo Write In Nights at Bookmans Midtown Bookmans Entertainment Exchange Midtown 3330 E. Speedway Blvd. 05jan5:00 pm7:00 pmNaNoWriMo Write In Nights at Bookmans Midtown5:00 pm - 7:00 pm Bookmans Entertainment Exchange Midtown, 3330 E. Speedway Blvd. Are you still working on that novel from November? No worries, we're keeping the NaNoWriMo momentum going with two write-in nights this January! Are you still working on that novel from November? 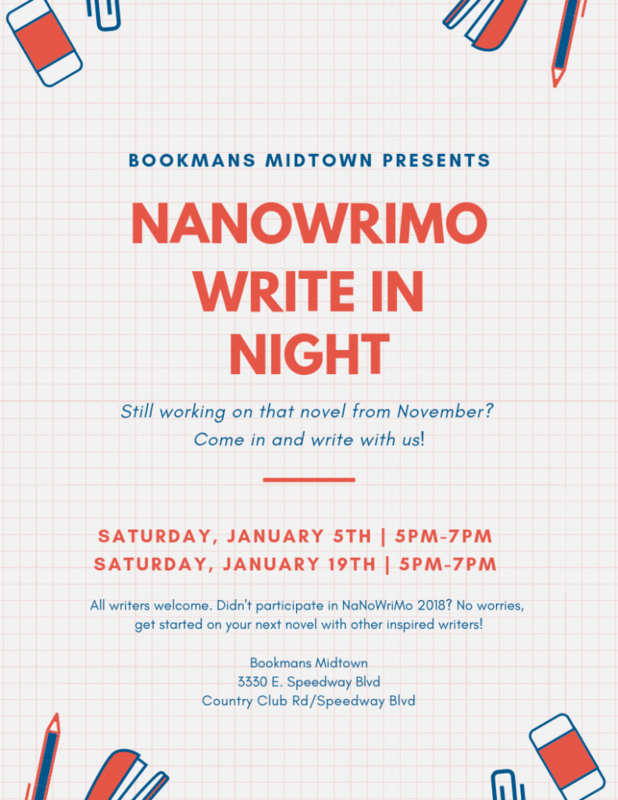 No worries, we’re keeping the NaNoWriMo momentum going with two write-in nights this January! Come continue that novel you were working on or start a new project! You didn’t participate in NaNoWriMo 2018? No worries, get started on your next novel or work on your passion project with other inspiring writers!